As many of you have urged, engineers from MassDOT and the Town have reconfigured the intersection to something resembling its original configuration — cars on Common Street north bound now have green for straight and left simultaneously and then the south bound cars get green and left simultaneously — as the intersection worked before the changes. The description below and the drawing above are no longer accurate. Thanks to MassDOT and the Town for responding aggressively to the problems. Keep the feedback coming. However, as of December 10, the project engineers still do want to retry the configuration described below which failed. The failed configuration makes good sense in terms of safety and throughput, but only if motorists can understand it. Whether signage, striping and possibly additional signals will accomplish that is an open question for consideration over coming months. Change is hard and important change has happened at the intersection of Common Street and Trapelo Road. It used to be that traffic with a green light on Common Street could turn left. Only one direction of Common Street had the green at a time. Now there are separate signals for left and straight. Both directions of Common Street go green for left turn at the same time now. And both directions go green for straight at the same time. Don’t continue across Trapelo on Common except on the straight green. 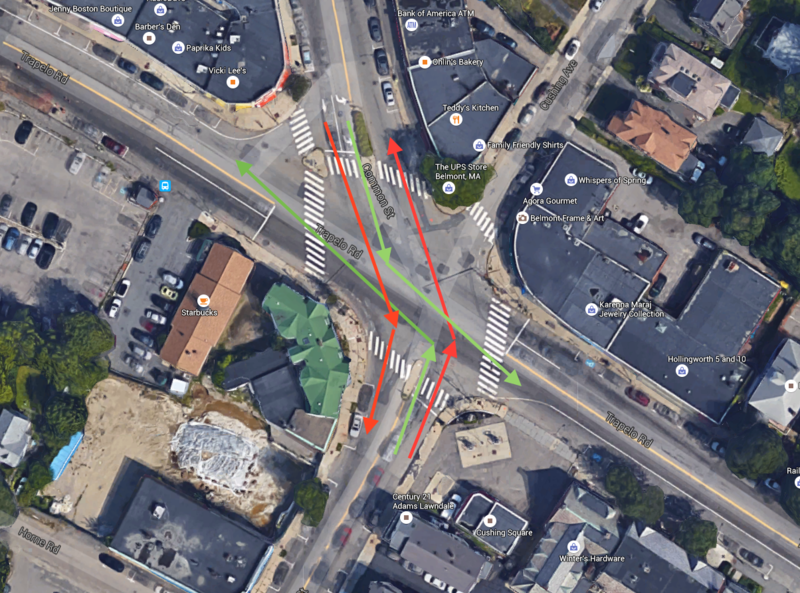 There has been serious confusion especially for traffic coming from Watertown — going straight on Common involves a slight left and many people have been making that slight left on the left arrow, which is intended only for the hard left onto Trapelo shown in green on the image above. This repetitive error is causing near collisions with traffic properly turning left from Common Street onto Trapelo from the Belmont Center side. Everyone involved is very aware of the confusion and the risk involved. The Belmont Town Engineer, the Belmont Police, Mass Highway and the consulting engineers are all working together to make the situation safer. The sign board will be re-programmed to better explain the purpose of the two lanes. There will be no parking allowed on the right side of Common street from the gas station at 500 Common Street to the corner. This will make it visually clearer that there are two distinct lanes at the intersection. Belmont DPW will paint an extension of the white lane delineation line on Common Street, from the end of the current white line to further up Common towards Belmont Street to help guide traffic to the proper lane. Belmont DPW will paint dashed white lines for the Left Turn Only lane so drivers will see exactly where they are supposed to go when they get the green arrow. For the rush hour tonight (approx. 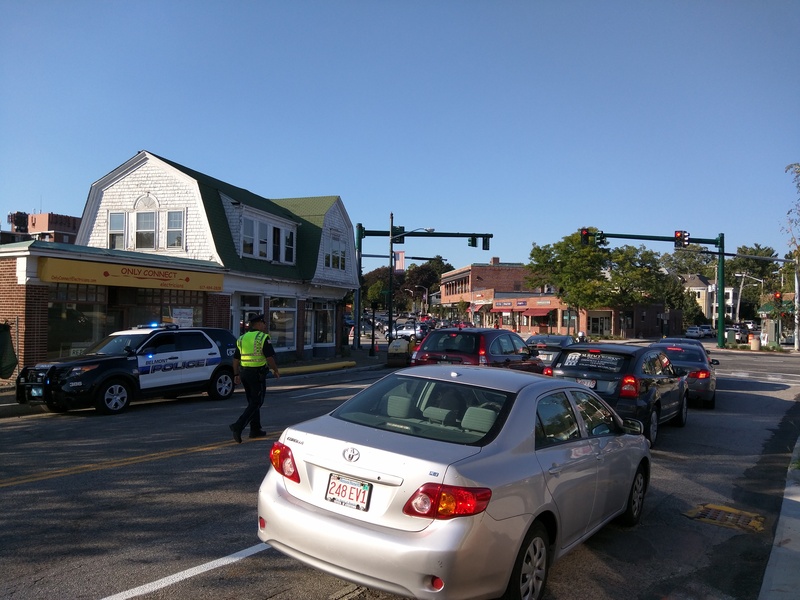 3-7) Mass DOT is paying for a police detail to work in the intersection to help motorists properly maneuver through the intersection. It is also recognized that an additional head directly adjacent to Common Street headed north may be needed to show red to cars likely to make the recurring error (going straight across Common on the left arrow from Watertown). See this earlier post for more updates on the Belmont/Trapelo Road project. This whole thread has been brought to the attention of the consulting engineers (initially on 9-21) and I am hopeful that they are considering all the suggestions and feedback offered below as they review the situation. I think a significant part of the confusion on the Northern side of Trapelo Road is that significant lane widening and occured right before the intersection. Going south through the intersection on Common Street there used to be a center island, which was removed, two traffic lanes and a parking lane. Now there is no center island, two lanes of traffic, a 2 foot strip that is perhaps an excuse for a bike lane and a parking lane. Basically it is the same layout minus the center island, an important feature for people with disabilities. The only explanation is that traffic lanes were widened, leading to higher traffic speed. Since there is now more space cars move faster through the intersection. As observed from the 400 block of Common Street traffic speed appears to have increased substantially while while not improving the traffic pattern in any meaningful way. This is not the kind of highway planning we need in Cushing Square. There is also a bump out, which does shorten the total traffic crossing for pedestrians, in compensation for the lost island — but I hear your point. I don’t think it’s the lane width there that is causing problems — I think it’s the fact that straight down Common Street from Watertown is a bit of a left turn and motorists think that the left arrow is giving them permission to go that way. Thank you for your response. However, the bump out only partially compensates for the loss of the center island. It greatly reduced street space for bicycles. I go through this intersection daily on a bicycle. The bump out forces bicycles to merge far into the travel lane causing an unsafe situation. A lot of people now drive very close to the bump-out, reducing the space for bicycles to nothing. The bump-out causes a kink in the northbound lane of Common Street, which in the absence of other traffic calming measures causes much of the awkward new layout. As measured by Google Earth, crossing distance on Common Street North of Trapelo Road, from ramp to ramp, is 55 feet, up from 40 feet in the previous design. The shortest crossing distance – perpendicular to the street, no handicap ramp – is now near 50 feet, up from 25 feet in the old design! The minimum crossing distance has doubled! Apart from the intersection itself there are now 3 travel lanes to cross for pedestrians mid-block, which is a crossing many people make on foot as the block is a shopping district with parking on both sides. My question is why they changed it at all! The intersection worked just fine before. If it ain’t broke, don’t fix it- that is not original, but it sure fits here!!! Even the bus drivers are complaining about the changes- especially the narrowing of Trapelo Rd. I’d like to have the engineers/designers travel it each day at rush hour- perhaps they would see the mess they have created. It’s a well vetted design. We are at a very awkward transition phase right now. When it is all done and and tuned up, I remain hopeful that people will see it as an improvement. Of course, the new pavement and sidewalks will be great regardless, but the design itself is well done — it was rated the best project in a pool of 150 by the agency selecting projects to fund. This is a bunch of baloney. You are narrowing the roads!!! You are creating traffic havoc, traffic jams, noise, pollution, wasted productivity, extra hours of sitting in our cars, frustration, anger. And all of that for what?? For extra sidewalk space?? I don’t see any sidewalk congestions, but plenty of road congestions. What an abomination if a project! Agreed it’s a mess right now. Hoping and believing we’ll all feel better when it’s done. How about the right hand lane sign saying “Straight ahead on Common St. MUST use Right Lane”. I have not been through the intersection from that direction yet. Yes. That’s the right idea. Signs of that type will go up on Monday if delivered as expected. Sorry, Will. That’s not “the right idea”. There is no “straight on Common”…Common is NOT straight. Further, drivers not indigenous to the area will not know which of the three possible ways in front of them is considered “straight onto Common”. Heavily verbose signage is indicative of a design flaw. The green arrow lights simply do not match the physical layout of the roadway. Will it take someone getting killed before you folks admit the design is flawed and the green arrows do NOT fit this atypical intersection?? Please fix the design…do not use bandaid fixes such as verbose signage. I don’t think the plan is for verbose signage — rather arrows next to the lights. We’ll stay on it until it works. It may turn out you are right. The new traffic signals on Trapelo Road are *very* high. Is that so people can see them from further away? I went through today, and I wonder if they’re as visible as they should be when a car is close to the intersection. That’s one of the questions the engineers are asking — whether a lower signal, perhaps on the island in front of UPS would help people focus on the red. But the next step is signage. Hopefully, Monday. I hope that parking will be prohibited on BOTH sides of Common St. on the blocks where the real estate office and vacant laundromat are located. it will be a very tight squeeze if cars are parked on either side. Thanks for all of your good work Sen. Brownsberger. Your reports are greatly appreciated! The intersection has become dangerous because of the change in the lights, but it worked perfectly well the old way, when only one direction at a time had the green and could proceed. Why fix something that wasn’t busted!!!??? Why mess up something that worked? I noticed another comment makes the same point. If you think about it, the new design is much more typical of other intersections. It is normal for left turns to happen at the same time. But it definitely needs better signage and possibly additional signal heads to communicate the flow. On the way. “if you think about it”…that’s your response? I wish YOU would think about it! There is nothing “typical” about the Common/Trapelo intersection; the north and south sides of Common DO NOT LINE UP. It is NOT “a bit of a left” as you have said…it IS a left. And therein lies the root of the problem. The solution is to revert back to a simple alternating green. Sorry, John. Didn’t mean to imply you hadn’t thought about it. I just meant that the signal phasing is not unusual. But you are quite right that the intersection IS unusual, with the five directions coming together, and that is very much part of the problem right now. Thanks for the update, Will. I was one of the near accidents a few days ago. I was turning left onto Trapelo, other driver going straight onto Common crossed right into my path. She looked at me like, “what are you doing, I have the right of way.” I have taken to avoiding that intersection. Someone is going to get hurt. Glad to know that officials are aware of the problem. How about a sign that says “Green arrow for left turn onto Trapelo only”? Thanks! Good to know in advance! I was one of the Belmont residents who tried to alert police and highway to this problem. Drivers are making the wrong choice constantly. I did not find the new wording on the electric signage intended to explain how things work at all clear to understand. (I have advanced graduate degrees.) I think you should be going back to the state to redesign this and change the light coordination. (I’m a landscape architect by training, too. My husband, an architect, thinks the arrow should be right next to the light and that the light which is red when the turn light is green is too high up for the drivers. I don’t know about this. Virtually every time we drive there, someone from Watertown is doing it wrong. Why did this have to be redesigned? It worked before. Now it doesn’t. I think you need to demand that the state come up with a real redesign. The wording on the electric sign doesn’t seem to be working to affect people’s behavior so far. Thanks. All good suggestions. We’ll keep the focus on it until we get it working. It happened to me several days ago; light turned green & I started to drive across Trapelo Rd when a car to my left (left turn only lane) crossed Trapelo Rd. I was alert & pulled back allowing the truck to cross Trapelo. Possibly, painted arrows would help. Thanks you Trappello Road Traffic Calming! Between the apparently Permanent biog orange blinkies in the middle of the road, confusing signage, potholes in the middle of nowhere, semi-paved surfaces, muddy roads and extra-congested traffic, we’re off to a great start! Yes, I’m nostalgic for 2009 when I first expressed my concerns about this plan, can’t wait to see how this all works in the Winter. As Louise mentions below, why did we change any of this? We took a working road and broke it. The intersection is geometrically defective from the get go, When near that area, I make great efforts not having to go through that intersection by detouring around the area. My only suggestion is to neck up and narrow each road prior to entering the intersection and use a lot of traffic calming designs like speed bumps, bump-outs. That is a tough design assignment without land taking or road narrowing/closing/one ways etc. I live right near this intersection and I agree that it was much safer prior to these changes. Making a left from Common onto Trapelo means swerving around drivers on the other side going straight on Common when they shouldn’t b/c they have a red light, but also drivers from Watertown turning left onto Trapelo at the same time are having near misses because of the angles involved. Yesterday, as a pedestrian, I saw the police nearly cause a car accident by directing cars to go in a way that was against the lights, further complicating things. That intersection before was fine for cars, but not so much for pedestrians. Now it is worse for cars and I don’t think the situation is much improved for pedestrians either as now cars from multiple directions may be crossing at once. Many thanks once again, Will, for being at, or ahead of, the curve and getting timely, rational and usable information out to us. This entire corridor project is moving this previously outdated,unsafe thoroughfare, into the 21st century.